Refrigerators are often energy wasters and clutter collectors, but what can we do to make them fit better into our simpler lifestyles? It’s a silly thing, when you think about: A fixed-size box, constantly drawing electricity to create an artificial environment in a little corner of our homes, whether we need it or not. We can take action to make our refrigerators function better and collect less clutter. And when it’s time for a new one, we can choose more carefully. My average-sized refrigerator came with the house, so I didn’t get to choose its size. If you’re renting, you’ll have to be satisfied with the size of refrigerator that’s available to you. And if you own a house that came with a new or used refrigerator, replacing it because it doesn’t exactly fit your needs is probably wasteful and impractical. Here are some thing that will help your refrigerator work for you more efficiently. Clean it out. Refrigerators work best when they are reasonably full but not crowded. So now is the time to do a thorough decluttering of its contents. Consider your condiments and check your crisper. Get rid of everything that you really don’t need. That bottle of barbecue sauce you didn’t like two months ago isn’t getting any better. And while you’re at it, wipe down the walls and clean up the spills. Of course, you need to do the freezer compartment, too. Part of a clutter-free home is an uncluttered refrigerator. Clean it off. Increase the energy efficiency of your fridge by making sure the outside is clean, the coils or whatever is exposed at the back are vacuumed off, there’s no debris underneath and you leave some clearance around it on all sides. If your refrigerator is too heavy to easily pull out from the wall, that’s a good sign it’s much too large. Remove or add shelves. I dramatically reduced my tendency to clutter up my refrigerator by simply removing one of the shelves and repositioning the other. I can now see everything when I open the door, and I can reach every item without moving several others. That means nothing can get lost in the back. The freezer compartment in my fridge, however, has no shelves at all, and I’m thinking about rigging one up. It’s hard to get to things on the bottom, and I know air can’t be circulating as it should. Rethink warehouse store cardboard boxes. For most us, the quantities of food available at warehouse stores aren’t practical, so skip them most of the time. Those huge boxes in your freezer keep it from functioning at its best, and often, the food toward the end of the box is freezer-burned, stale or icy. Buy what you need in the next week or two at stores with good prices and you’ll be upgrading your eating from freezer chic to fresh and flavorful. Rethink multiple fridges and deep freezers. If your household is only two to four people and you have more than one refrigerator or a separate deep freeze, you’re probably not using your space wisely. Unless you’re a freezer food guru who prepares all your means weeks in advance, you probably don’t need an extra freezer. And what’s in the refrigerator chugging away in the garage? For everyone I’ve ever known, it’s beer and a few things they overbought at Sam’s Club. Living a simple, deliberate life means simplifying every aspect of your life. Having twenty condiment bottles in the refrigerator door just doesn’t fit into this kind of lifestyle. And here’s a fact: If your machine is more than a few years old, it’s not very energy efficient. While it might be impractical to replace a refrigerator that’s still working well, it also doesn’t make sense to let the size of the gap in the cabinets determine how large your refrigerator should be. I have one friend — a woman in her 70s who lives alone — who recently had to replace her refrigerator. She choose one that matches her size. It’s less than 5 feet tall and several inches narrower than the one it replaced. True, you can see the mark on the floor where the old one was, and she had to paint the wall behind it because so much more it shows now, but she’s reduced her energy usage, eliminated a potential clutter collection point (something that doesn’t seem to be a problem for her) and feels better about her choice. She also didn’t have to take down any doors to get it in the house. Once you’ve eliminated the non-essential items and made a commitment to yourself to store more reasonable amounts of food for reasonable lengths of time, you’ll realize you probably need a much smaller fridge. So how do you rate on refrigerators? How are you fixed for freezers? Does your refrigerator accurately reflect your simpler lifestyle? I think for me I only need a dorm size fridge and I could call it a day. Most of everything I eat is kept in the crisper and I buy that stuff every day or two (being a vegan I thrive on fresh everything and the grocery is on the corner of my road and I stop by almost everyday). I don’t do any dairy so I have no reason to store all that stuff and other than mustard, BBQ and soy sauces I have no condiments. Hubby does use a little bigger variety of stuff (no vegan there) but still we don’t take up a shelf on the door. So I keep the fridge full of gallon jugs of water to take up space and cut blocks of styrofoam. The helps the fridge stay full and not cycle as much. And of course it is a massive huge fridge with double doors that also goes into a built in cabinet. The freezer stays a little fuller because I freeze a lot of things for hubby when I cook. Because he is eating for one things will go bad quickly if I don’t. Does the whole contraption fit my lifestyle? Not in the slightest, but it fits the house and that makes hubby happy. 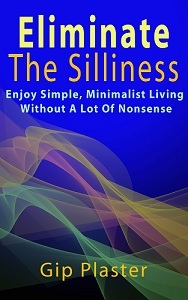 What can a minimalist do….. I think a dorm-sized refrigerator is big enough for us, too, as long it is the kind with a decent-sized freezer. It would look a little strange at the end of the cabinets. I guess I would need a table or something to put it on or it would be an exercise program to get into it. Excellent post! I’ll be sending a link to a friend who mentioned he wants to buy a small freezer, and whose fridge often runneth over. I needed to read it myself, for that matter, as I am in about the same boat, except I already have the second fridge/freezer! Time to learn to buy just a week or two worth when I shop. Thanks for joining the conversation here, Mike. I’m glad to have you here. It’s great that this post is helpful to you, and I hope your friend can benefit. This post hasn’t gotten a lot of attention, so I’m glad someone is reading it. I have large frig(desperately need to declutter it)….also. 2 upright freezers…hubby is big hunter….and we put up a large garden for our own needs and to share with family/friends…tomatoes….peas…onions…all the things you grow to love in East Texas. Hot here also! AC’s are running non-stop as I’ve started working from home this summer…. …but I’m a work in progress! !